1.This series machine adopt microcomputer control high precison electro-hydraulic servo valve to drive precise hydraulic cylinder and realize auto constant speed control to test force, dispalcement, deformation. It comply with national standard GB/T5224-2003 Prestress Steel Strand for Concrete, can test tesile strength, non-proportional extension strength, elastic modulus, elogation and other mechanical performance. It is the ideal equipments for industrial and mining establishments, scientific and research units, colleges, project quality supervision departments etc. 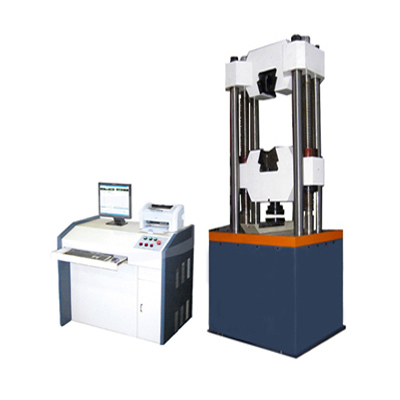 2..This series machine adopt underneath type hydraulic cylinder; open jaw bases, easy to install specimen, simple, stable, reliable and easy to maintain, applicable to steel strand tensile test. 3.Using independent hydraulic clamping system to ensure system can run with low noise, stably, no-sliping of specimen. Using high precision full digital broadband hydraulic servo loading system to ensure hydraulic system high precise, low noise, quick response. 4.Using full digital control system to finish test parameters setting, control process auto control, data acquistion, processing, analysis, storage and display (test data including: yield point, tensile strength, fracture strength, elastic modulus, non-proportional extension etc.). It has closed-loop control to test force, deformation, piston displacement and test procedure, and constant speed control to stress, strain, test force, displacement, load holding, displacement holding. Also it has open-loop control function. 5.It is equipped with special accessory for steel strand to ensure test procedure meet standard requirement. 6.Its test software is based on Windows operating system with reliable hardware and software.